You can subscribe to just about anything today. I can remember, as a kid, that one of our neighbors got a fruit of the month shipment. We were fascinated by what kind of fruit he might get the next month and when the box arrived – we were all there for a peek and a taste. It wasn’t just that we didn’t see a lot of papaya in Minnesota, but it was the novelty of the monthly shipments. Fast forward to 2019 and you can subscribe to pretty much anything from razors to dog toys to clothes, cosmetics, ingredients for a complete dinner or fine wines from a specific region of the world. On the B-to-B side, there’s Leadership in a Box, MentorBox and many more. In case you think it’s all consumable products, Porsche even has its own subscription offering. There are quite a few websites dedicated to telling buyers about their subscription options. Those websites had over 37 million visitors in 2017 and the numbers are rapidly climbing. It’s a fascinating cultural shift and it’s worth thinking more about, in terms of how we go to market with our products and services. Like most trends, this one snuck up on us a little. Technology made companies like Netflix and Spotify seem natural. Why wouldn’t we want hundreds of thousands of movies and other videos at our fingertips for a small monthly fee? Why buy CDs when you can mix and match your music on a whim for a few dollars a month? What are the elements that make a subscription model work? Personalization is key: In many cases, it’s the ability to cherry pick the items or types of items that are appealing to the subscriber. The personalization might also be in frequency of delivery or the number of items in the shipment. A specific why: Some subscription services like Dollar Shave Club are all about having a steady supply of the items. The fashion boxes are all about having someone else recommend the right look for you and then do all the work of putting together just the right pieces. Some are a blend of the two. The meal subscriptions are about having someone else figure out what’s best for you and serving it up right when you need it. The B-to-B boxes like MentorBox are about access to information and insights. Creating a connection: All subscribers drift off eventually. The key is to maintain the subscription for as long as you can. The longer they subscribe, the more profitable it is for you. The tone of your communication, the access you offer to your CEO or leadership team and the secrets you let your subscribers in on can all deepen the relationship and extend the subscription. Build a community: There’s incredible power in word of mouth, referrals, and reviews for subscription services. Find ways to connect your subscribers, whether it’s a Facebook group, a car window decal or exclusive events where they can meet in person. What do you think? 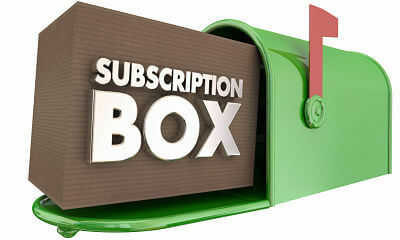 Could your business jump on the subscription bandwagon? Before you dismiss it out of hand, do a little legwork. I think you’ll be surprised about who is active in the space.